I am almost at the end of GS1 and preparing for GS2. Each forgeable material now has a "target level range" and the places where they can be found have been changed accordingly. Tear stone: ~21. very early eastern sea. Stardust: ~23. early to mid eastern sea. Taopo, aqua rock and early gaia rock. Sylph feather: ~25. Mid to late e.sea. Ankhol to Lemuria. Dragon Skin: ~28. early w.sea. From right after grind till shaman village. Golem Core: ~30. Contigo till reunion. Sala Tail: ~33. From reunion to Loho. Mythril silver: ~35. Loho to Prox. Orichalcon & Dark Matter: After teleport. How does it work exactly ? Can they be found on all the monster of the area ? No, i'm just saying what the overall level of the item is. I rearranged treasure and drops from that though, and you can find info about both in the respective sections (same post). I got a Spiked Armor, but without using a mercury Djinni (Ivan Assassin Blade). Is the wiki wrong or is the drop system changed ? Because I am trying to get a a Kikuichimonji since this morning without success using a mars Djinni on a Fenrir. Edit : anyway, I just finished the game. My strategy at the end was always the same : granite, flash, ground on Ivan with Garet / Isaac summoning (mars / ramses) so they can come back quickly or attacking with their high attack. Mia spamming wish spells with PP recovery items. The difficulty was OK, except for these guys way too easy to beat, even if it is repeatable. Edit2 (below) : OK I thought killing with a specific Djinni was mandatory to have a chance to get the item, but it seems not. It is sad to have to use RNG to get these items. Speaking of RNG drops, I think unique item drop rates could stand to be increased to the point where you don't need to use the RNG trick to get them. I didn't mind it at first but it started to get annoying when rigging for items that I want a bunch of like Mythril Silver and Orichalcum. 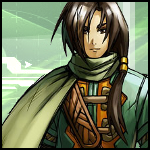 I just recently got into Golden Sun and figured I probably wouldn't play it again because of the tedium, but then I found this, which has proved to be several times more enjoyable than the original, and I think I'll be playing around with this hack for a while. 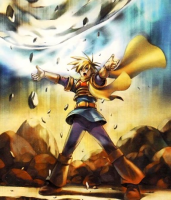 All the changes that have been made have made the Golden Sun experience a lot more engaging, so thank you for that. That aside though, I noticed something weird about the Karst and Agatio fight, as well as the Flame Dragons fight. Both Agatio and the Agatio Flame Dragon have a skill that massively buffs attack, but the name of the skill simply displays as "? ", as shown by my screenshot below. I highly doubt this was intentional, but I also noticed that when you mentioned a while back that you were buffing Karst and Agatio because they were too easy, you included that Agatio has a "stronger high impact" but you didn't mention a specific name for the skill. Now that I've gotten everything important I want to say out of the way, I figured I would respond to this. If you're at the point where you're grinding for drops, you may as well just edit the drops in the TLA editor yourself and farm as much as you want, then change them back if they're going to fill up your inventory. Though to be completely honest, I wouldn't mind higher drop rates for most items because it's really rare for good drops to show up in any normal playthrough. not gonna lie, it is annoying. but timewise, i don't know how faster it'd be if i actually decreased drops. the lowest i can realistically put them is 1/64, right below the threshold for "must use djinn" to get the drop. Correct me if i'm wrong, but with a djinn 1/64 would increase to 1/16. I think it's faster to manipulate the RNG for one battle rather find and fell 16 times a certain enemy with the right djinn. thanks for reporting that. it is usually the most common bugtype for my mod, cause i play with (and make changes on) my italian version and then port stuff to the english one for releases here. That's why strings are an easy miss for me, cause i just don't play with the english version to notice that and it happens that i forgot some of them while porting. btw I just released an update that gives that move the name "giga impact". please keep reporting any text related issue or doubt you might find, no matter how little.